Now in its 13th year, the Abingdon Air & Country Show has grown from a small event to now being a highly respected curtain raiser. This year the show returned to it's 'traditional' May Bank Holiday weekend and had a full and varied flying display lined up. Peter Reoch reports for UKAR. Addition photos from Trevor Reoch, Steve & Catalina Buckby and Martin Eames. The word on everyone's lips in the week preceding the show was weather, with the wettest April in a century and many areas being left waterlogged. Memories of RIAT 2008 came flooding (pardon the pun!) 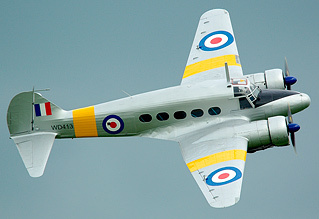 back and fears about the show were further increased when the Spring Show at Old Warden, scheduled for the same day, was cancelled. However, Neil Porter and his team at Abingdon assured people the grounds at Dalton Barracks were in good shape and the show would go on! 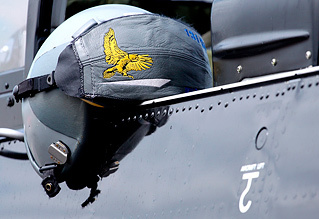 A theme the organisers wanted to try and showcase was the 80th Anniversary of RAF Abingdon. 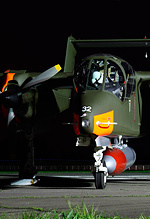 On the ground, examples of Bulldog and Chipmunk aircraft which had previously served with 6 AEF, as well as restored cockpit section of an RAF Jaguar all represented the station's past. The anniversary commemorations were also present in the flying display line up too, with the Miles-Whitney Straight, Avro Anson, DC-3 Dakota and RAF Hawk T1 solo all having Abingdon heritage. A VC-10 from nearby RAF Brize Norton was also due to appear, fitting in with the theme, but sadly due to heavy operational tasking cancelled a few days before the show. As the name suggests, Abingdon isn't just an airshow. The showground has a friendly, somewhat village fete-esque, atmosphere and features all the various ground attractions you'd expect at a country show, with a large MG car rally a notable example. Though the static display is small at the show (aside from the flying display aircraft which were operating from the airfield) it did have an international flavour, with a Pilatus PC-7 from the RNLAF making a rare UK appearance alongside the Abingdon regular that is the OV-10 Bronco. The spare display Tucano (in black and white Jubilee scheme), Tutor T1 & Vigilant T1 were also present in the static park. A Merlin HC3 from nearby RAF Benson arrived in the morning and was open for the public all day, leaving at the conclusion of the flying display. The RAF's newest support helicopter is always popular with the crowds and it's a real shame that the high operational tempo for the Merlin force has prohibited a flying display of the type since 2006. A surprise addition to the show got things underway in the air, in the shape of a "practice display" for this years Lynx AH7 solo display from the Army Air Corps. A welcome return to the display circuit for the Lynx, with an exciting routine boasting plenty of the famous Lynx backflips to wow the crowd. The rotary theme continued with two flypasts from the Thames Valley & Chiltern Air Ambulance, which was originally scheduled to open the flying display. The show has supported the Air Ambulance charity since 2007 and in that time has donated a staggering £23,500 to the cause. The noise of rotor blades was quickly replaced by that of jet noise, with the season debut of Hawk T1. 2012 is the last year that we will see a RAF Hawk T1 solo display and from first impressions this year's display will give the jet a good swansong after the criticisms of recent years. The display feels much closer and sharper than those we have become used to, with a lovely topside pass added to please the photographers, which will be especially enjoyable when Flt Lt Bird's special schemed jet has been painted and is ready for display use. The other RAF trainer solo display were also making their 2012 debuts at Abingdon with the Tucano, Tutor & King Air all putting in spirited performances. 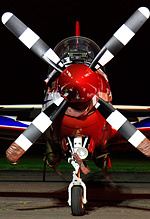 Also in new colours from 2012 were the 'TRIG Aerobatic Team' (previously the Pitt's Pair) with their two Pitts Specials. Fans of historic aircraft and warbirds were well catered for at the show with a P-51 Mustang, Hurricane I, Jungmeister, Bestmann (making it's airshow debut) and Spitfire PR19 from the BBMF all displaying, plus the aforementioned Miles-Whitney Straight, Anson and DC-3. The Dakota ("Drag 'em 'oot" from East Kirkby) and Anson (WD413 from Coventry) put on a gorgeous pairs display before breaking off for their individual routines. Both these aircraft are very rare airshow attendees and Neil Porter should be commended for seeking out something different. A last minute addition to the show (booked when it looked like a cancellation from the Dakota was inevitable) was the gorgeous PBY Catalina from Plane Sailing at Duxford, another classic aircraft we don't see enough of. She looked wonderful at Abingdon, and we were fortunate to see her as the booking only became available when Old Warden's Spring Display had succumbed to the wet weather. 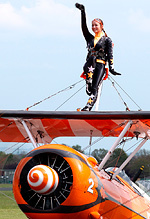 Brietling continue their support for classic aviation with their sponsorship of the Brietling Wingwalkers and their colourful Boeing Stearmans. The two-ship routine seems to have changed this year, with more opposition manoeuvres rather than lengthy formation sequences, something that works very well and pleased the crowds. Unfortunately their extra thick smoke didn't have the same effect when the prevailing wind blew the white haze into the crowds. In my eyes, the organisers of Abingdon year on year do an excellent job of creating a respectable flying display to please a varied audience. Sadly this year did feature a number of cancellations; the T28 Fennec going sick on the day meant it was unable to display and operational commitments prevented the SHAPE UH-60 making it's usual static appearance, as well as the C-130J, VC-10 and Tristar flypasts, but with the strain that the RAF airlifters are currently under it's totally understandable and out of the organiser's hands. For me, Abingdon will always be a favourite as it is a nice relaxed way to start the airshow season. 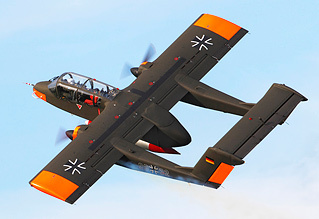 There's not the huge crowds to fight against like at other shows, and year after year the organising team pull together a flying display that will not only please Joe Public, but also feature rarer items to appeal to the enthusiast. With a ticket costing only £15 at the gate, there's really not much to complain about!